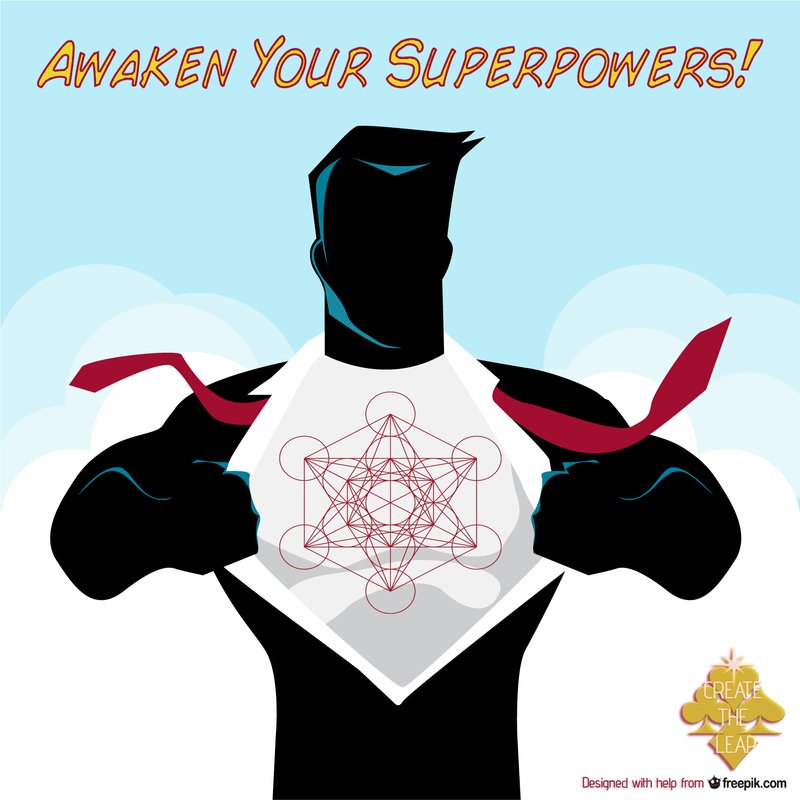 It's Time to Be Superhero Consciousness & Experience 12-strand DNA Activation... Together! It's a Bird! It's a Plane! It's 12-strand DNA! How are superheroes born? From the imagination of an inventive graphic novelist? From childhood dreams and play? Or are they a "remembering" of all those powers we possess, lying dormant in our very makeup? WE ARE SUPERHEROES. But before we get into how, let's get into why. This requires some brass tacks-talk. Ready? We carry within ourselves a blueprint drafted in love. What does this mean, exactly? Imagine your body, your brain, your consciousness had every intention to be an X-mansion, or an enchanted castle (Hogwarts perhaps? ), a space station, or maybe the Mall of (Captain) America. Whatever structure exists from your wildest dreams. You may be living in just one wing of this construction, or on really limited days, probably just the broom closet! The 2-strand DNA keeps us cornered in our consciousness--for good reason. But now it is time to EXPAND to 12-strand DNA and explore every nook and wide-sweeping wing of our blueprint! If you're reading this, it means you're ready to transform and experience the 12-strand DNA activation. What Is The Love Intrinsic? The Love Intrinsic is just a way to say that you are Source embodied. Love Intrinsic Alignments are agreements in energy. As you are receiving an alignment, you are agreeing at a soul-level to recognize the love that you are, and shift into living this innate blueprint. We call the time of keeping our expansion in the realm of dreams the Age of Intellect. Now, we are living the Age of Omniscience--where our "powers" stem from recognizing ourselves as each other. The fact that you are doing this alignment with other people is a display of faith that you are no longer just responsible for yourself--rather you are shifting to group consciousness. This group energy no longer clings to fear and limitation, rather it is magnified and supported by the Love Intrinsic. The time for great misfortunes and disease is over. The time of shaping life from external guidance has passed. NOW, you are realigning to the great energy that you are. Call it divinity, call it soul, call it superhero constructs--you are able to be your own healer, your body your wise guide, and your heart open in recognition that you share and co-create experience with all others--not as separate, but as intrinsic to you. Yes and no. A healing suggests that something is wrong, or broken, or needs to be fixed. We prefer to think that the blind person whose eyes begin to see are not healed, they are simply accessing the parts of their body they were born with. You are born with 12-strand DNA that has been "dormant" so that you could experience a dramatic and dualistic reality with 2-strands. Just like the eye that begins to see, this alignment awakens that construct of "sight" so that the world/existence will be visible in a whole new way. Physical, mental, and emotional maladies will begin to adjust from the limitations of the old paradigm--of lack, of fear, and of separation to that of freedom, connection, and trust that is natural. The way it occurs is as unique as you are. It may clear up immediately or after some time. You may get clarity on why the body has manifested an illness or limitation. You may find yourself co-creating with others to clear this energy, such as a friend pointing out a repeated pattern in your life that you can now see clearly and stop, or finally forgiving your parents/partner/children/self and offering them/you unconditional love. These are all situations brought to you by your connection via the Love Intrinsic in us all. The alignment does not heal necessarily; it simply restores you to your natural blueprint of ease, trust, patience, and a constant sense of vibrance and appreciation. You don't need to get aligned over and over and over again. That's old paradigm. The 12-strand DNA activation is complete as the alignment is done. We have faith in the new paradigm in our bodies, in our relationships, in our creations. The group alignment is complete in one session. A container is created with the energy of a group, and it is a physical reminder that we are now bound to each other in consciousness. Once it's done, it's done, and there is no "returning" to the old paradigm of limitation and shadowy corners of your magnificence as love. Superheroes Always Share their Power! The Love Intrinsic Alignment is special in that it's the gift that keeps on giving. As you receive the energy, there are 5-12 "future" alignments that you'll hold until you cross paths with someone else who is ready and asking for the alignment. As you're aligned, you understand that "you" (aka your ego) are not responsible for finding that person or knowing how to pass on the alignment. It rather will feel like being in the right place in the right time with the right person. It can be done as easily as holding that person's hands or closing your eyes and connecting your heart with theirs. It feels like grace, and like surrender so the energy moves as it knows how to do. NOTE: For the "Party Alignment" the number of alignments to pass on will differ from this. So what are My Superpowers? Guidance and suggestions from your “body” consciousness--knowing what to eat, when to rest, what certain emotions are indicating, etc. Receiving energy from sources other than food/sleep, etc. Development and practice of “Jedi Mastery” magic--telepathy, astral travel, timewalking, lifewalking, spiritwalking, etc. *Referencing and Phasing are both constructs within the Age of Omniscience. More explained throughout our website and in our "Glossary of Terms & Far-Out Ideas"
A group alignment comes with some kudos. Like babies born together, you'll carry the intuitive traits of twins, or maybe "duodecaplets" (12!). We encourage you to continue exploring these qualities you can access with 12-strand DNA in a group. The group sessions come with a "mini-workshop" that can focus on one of these topics. Just let us know when you book! Begin to experience shared journeys, dreams and other manifestations of your light body or what we call the 2DD Vessel. Explore shared lives together. Discover which roles you play in other incarnations and how that affects and supports your current relationships. You are not just a walking-talking crystal, you are a CRYSTAL FORMATION! Utilize this structure to assist each other in meditation, focus, healing and offering love to a changing world! Pay together & play together activated with 12-strand DNA! These sessions can be done remotely or locally (if in Asheville or while Randi is on tour). Included in the price is the alignment, and short session on any questions or topics of interest. You'll receive material, resources and group discussion on our website, forum and social media. 2 person alignment in 1-hour session. 3-4 person alignment in 90-min session. Pay solo but experience the alignment together! Pay solo but experience the alignment with a superhero partner! Pay solo but experience the alignment with 2 superhero sidekicks! Pay solo but experience the alignment with a superhero trifecta! These two-hour sessions are done with Randi and the guides in person. They include the alignment, a mini-workshop and Q&A to explain a bit more about the effects and changes that transpire from the alignment. Group of 5-12 people. Alignment created in person. 2 hour session for alignment and mini-workshop. More than 12 people. Alignment created in person. Messages from our Superheroes Already Up & Away! After my alignment with Randi, I have experienced a profound shift, and what I refer to as "scales falling from my eyes". I have more clarity in regards to my life, my purpose, my past. I feel centered and grounded and more "me" than I have ever been. My physical sensations during alignment and afterward have moved me towards healing old wounds I'd forgotten and ignored, helped me focus my scattered thoughts, and provided me with impetus to make changes. I highly recommend an alignment.